...not a heck of a lot changed. I have a hard time seeing how anyone would actually change their mind as a result of last night's debate, and the Ipsos flash poll largely confirms that. 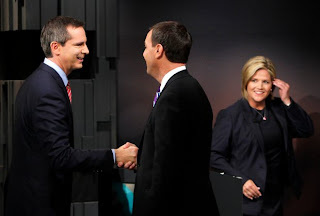 After all, if you're like me and you like Dalton McGuinty, you liked what you saw. While the opposition focused on buzzwords and empty anecdotes ("Gary the accountant tells me he lost his job because of the HST"), McGuinty made his case his facts and figures. He responded to attacks, defended his record, and talked about his plans. He looked and sounded like was a grown up - some might even say a Premier. That's not to say it was a masterful performance we will all rave about years from now. He fought much of the debate on weaker ground - there was a lot more talk about taxes and energy prices than about Health Care and education. He took some hits. But that's the life of an incumbent - the important thing is, he held his ground. Hudak was the leader who most exceeded my expectations, but that likely says more about my expectations than about his performance. I liked his "big screen TV" and "lemonade stand" metaphors, and he showed real emotion when talking about his daughter's experience in the Health Care system. If you were scoring the debate on points, Hudak landed the most blows. His "nobody believes you anymore" soundbite will probably lead off most clip packages. However, the one knock on Hudak's performance is a biggie. Quite simply, he looked and sounded like an opposition leader, not a Premier. He mentioned "Changebook" and his "5 point jobs plan" a few times, but there were only scattered descriptions of specific platform promises. He went after McGuinty at every opportunity - even when asked directly about what bold ideas he had for Ontario. It was a good performance, but not one that screamed "Premier-in-waiting". And then there's Andrea Horwath. Horwath had the most to gain from this debate, and she likely helped herself out a bit. She was likable, and played those tried and true NDP hits - "hike up corporate taxes", "results for people", "putting people first". Personally, I wasn't moved. She talked about the difficulty of balancing a family budget as a mom...on her lowly six-figure MPP salary. She talked about the awful treatment her son received at a Hamilton hospital...and later admitted the story was more "illustration" than fact. She told a story about a woman who gave her a big hug because she loved the NDP platform so much. Personally, I found it all manipulative and lacking substance. But it will play to Horwath's base, and may even rope in a few undecided votes. Add it all up, and after 90 minutes of debating, we're no closer to figuring out who will win on October 6th. 6:35 pm: Quite the tie Tim Hudak is sporting. 6:46 pm: For those keeping track of mentions of random "hard working Ontarian" anecdotes, we've heard about the problems facing Ryan, Kevin (the Wallmart worker), and Katherine so far. 6:54 pm: Interesting set...is everyone up for a game of paintball afterwards? 6:56 pm: McGuinty has put on his glasses and is taking notes. Nothing says "don't harm our fragile economic recovery like wearing glasses." 7:20 pm: Anyone else wish Gilles Duceppe was up there, just for old time's sake? 7:23 pm: "Facts are always helpful" - that basically sums up McGuinty's debate so far. 7:29 pm: Andrea Horwath tells a touching story about a young girl who came up and hugged her because she thought Andrea's platform was so amazing. 7:45 pm: Horwath has now brought up her mother, her brother, and son during the debate. Still waiting to hear what Uncle Bud thinks of the HST. No one knows who will win the Ontario election, two of the three leaders remain virtual unknowns, and the campaign still lacks a ballot question. Yet somehow, without warning, Ontario finds itself just 9 sleeps away from Voting Day. So tonight's debate will be important. I'll be live-blogging the festivities starting at 6:30, and will offer my thoughts on why Dalton McGuinty won afterwards. Dalton McGuinty: McGuinty has taken his lumps over the past eight years, and was written off by most pundits just a few months ago. Voters wanted change, Ontario's economy was sputtering, and the HST was about to claim its second victim. 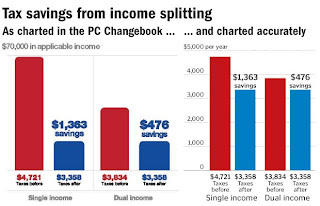 Yet here we are, closing in on E-Day, and "The Taxman" is tied with Tim Hudak. McGuinty has looked cool and been on message since day 1. He has played up his "experienced leadership" through tough economic times, and cautioned voters against risking Ontario's stable economic recovery on unproven leaders. 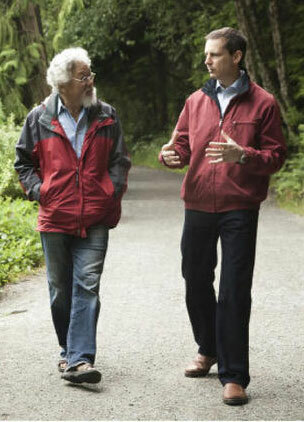 The man is one blue sweater vest away from being mistaken for Stephen Harper. I know Liberals will squirm at those words, but I mean it in the nicest way possible. 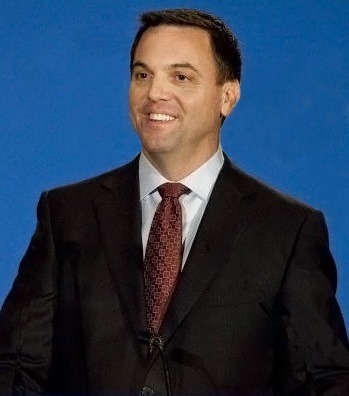 Tim Hudak: The PC campaign has focused almost exclusively on two isses - taxes, and Hudak's BBQ skills. While most voters concerned about these two issues will no doubt vote PC on October 6th, Hudak's set list hasn't moved much beyond this (with the exception of his controversial "foreign workers" jab). 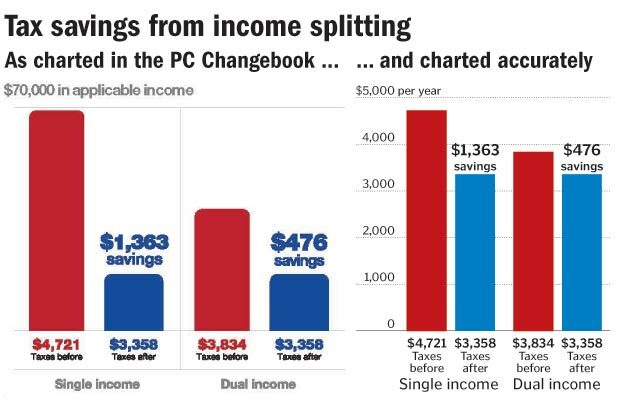 Given McGuinty hasn't actually promised to raise taxes, and is likely a fine BBQer himself, Hudak will need to show he's more than a tax cut sound machine tonight, if he wants to win. Hudak always struck me as a bit of a Stockwell Day type, so he's the odds-on favourite to use a prop during tonight's debate. Andrea Horwath: Most Ontarians can't pronounce her name and wouldn't recognize her on the street, yet they'll still tell you they like Andrea Horwath. Being liked and unknown means Horwath has the most riding on tonight. A strong performance, and it's not impossible for her to pull off an "accidental" win on election night à la Bob Rae. If she Iggies the debate, all the positive Jack Layton feelings in the world won't be enough to keep her in the mid-20s. Horwath will be standing centre stage tonight, which is appropriate, since all eyes will be on her. The Peterborough This Week telephone poll suggested Liberal candidate Jeff Leal had a 45.5-per-cent share of the vote compared to 28 per cent for Progressive Conservative candidate Alan Wilson. Yes, whenever a poll that doesn't "feel" right is published, you can count on Dean Del Mastro to settle the issue. It's just one of the many things Dean does to help protect democracy in Canada. So what cutting-edge methodology did Del Mastro use, to ensure that (natoriously pro-Liberal) six-year-olds were not skewing survey results? Sadly, Del Mastro did not ask the most important question on the minds of voters - "Given Dalton McGuinty is a poopy head, do you support his secret puppy genocide agenda?". Sadly, we may never know what the residents of Peterborough think on this burning issue. So again, thanks to Dean Del Mastro for championing democracy, one demon dialled push poll at a time! I salute you sir. Yes, Ed Stelmach turned 15% on the first ballot into a win in 2006, but those were very different times. The frontrunner had received just 30% after a lackluster campaign. Voters were looking for a third way in what had become a polarized Dinning-Morton feud. The 4th, 5th, and 6th place candidates all threw their support behind Stelmach. Sure, Mar's supporters could become complacent. But the also-rans have all seen which way the wind is blowing, and Alison Redford would need to triple her vote to take it. Only something truly remarkable can prevent Mar from becoming the 5th Premier in Alberta's Tory dynasty. The most surprising number in round one is not Mar's total, but Morton's. Morton received 26,000 votes in the first round in 2006 and 41,000 in the final. Since then, Morton beefed up his resume with a stint as Finance Minister. Yet there he was, unable to rally even a third of his former supporters. 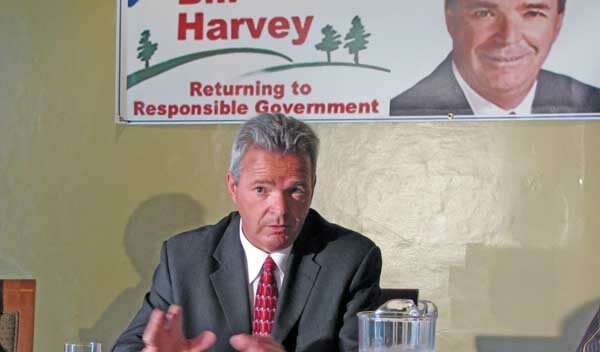 Morton blamed the harvest, but the reality is most people who were supportin' Morton in 2006 have long since migrated to the Wildrose Alliance. I don't think Morton will follow them, but it wouldn't surprise me to see the 62 year old professor hang up his spurs before the next election. Maybe him and Tom Flanagan can do a weekly podcast together, or something. For pretty maps, mosey over to labradore or Daveberta. It was interesting to see Mar sweep Edmonton, given he's a Calgary boy. Some will no doubt chalk up Mar's win to his edge in establishment support - after all, he had endorsements from 26 MLAs and some guy named Ralph Klein. There's some indication this paid off - Mar received 54% of the vote in ridings where he was backed by the local MLA, compared to 35% elsewhere. Which sounds impressive until you consider that Ted Morton's support was 14-points higher in ridings where he was endorsed (24% vs. 10%) and Doug Horner's was 38-points higher (46% vs. 8%)! Yes, in a lot of cases, MLAs endorsed candidates they knew were popular, but Mar's team still delivered in ridings where the local establishment was working against him. All are Horner backers, unsurprising given his concentrated support in the rural north. On the Mar campaign, Thomas Lukaszuk (+30), Dave Hancock (+26), and Naresh Bhardwaj (+24) delivered the most, while George Groeneveld (+27) and Evan Berger (+21) were both more effective at delivering for Ted Morton than Ted Morton was. And for those curious, the "thanks, but no thanks" award for the least effective endorsements is shared by Lindsay Blackett, Yvonne Fritz, Len Mitzel, Barry McFarland, Richard Marz, and Ken Allred. For these 6 MLAs, their candidate of choice did worse in their home riding than elsewhere. Hat Tip to Tim Duncan for the endorsement numbers. September 2nd: Thomas Mulcair says he won't run for the leadership of the NDP unless the party agrees to hold its convention in late winter or early spring, because he wouldn't be able to compete in a short race. September 19th: [Muclair] told reporters on Monday that he has truly not decided if he will throw his hat into the ring because the numbers for a Quebec candidate do not add up well. Although the majority of New Democrat MPs are from Quebec, “Quebec is the only province that does not have a provincial wing of the NDP,” said Mr. Mulcair. I've spent the last hour wracking my brain to come up with a rationale for how Mulcair's musings might help him in this contest, but can't think of anything. Given that general elections only matter in Alberta every 30 or 40 years, the PC leadership race is really the one chance Albertans get to have their say in who becomes Premier. Not surprisingly, over 140,000 Albertans voted in 2006, and we could see close to that number casting their ballot tomorrow. Assuming no candidate nets 50% + 1 on the first ballot, the field would be narrowed to three for a showdown in two weeks time. The fun thing about this race is that you can keep selling memberships right up to the final vote, adding an element on unpredictability. That's how Ralph Klein beat establishment darling Nancy Betkowski in 1992 and how Ed Stelmach came from nowhere to win in 2006. If these numbers are to be believed, we're looking at a final ballot of Mar, Redford, and either Horner or Morton. With the undecideds factored out, Mar would be in a better position than Jim Dinning was in 2006 when Jim was held to 30% on the first ballot. But remember, Ed Stelmach came from 15% and third place to take it, so a Redford or Horton win isn't unfathomable, depending on what we see tomorrow. The more polarizing Morton will have his work cut out of him - even if he comes in at 20% on the first ballot, I don't see him having the growth potential he'd need to pull it out. With many of his supporters having already jumped to the Wildrose Alliance, Ted Morton does not appear to be the man this time around. Sure, we're only in the third inning, but this is encouraging for the Liberals for reasons beyond the obvious. It will energize the ground troops and, most importantly, will shift the media narrative in McGuinty's favour. No doubt, had the polls shown Liberals losing ground, we'd have seen stories about a Liberal campaign in turmoil over its controversial immigrant tax credit proposal. Instead, it's Hudak who will likely be on the hot seat. We shouldn't let polls dictate the narrative, but it's foolish to think they don't. For a party down 10 points earlier this year, this buys McGuinty a few days of positive coverage. I find the media generally tends to assign too much importance to endorsements during leadership races. After all, Christy Clark came out on top in BC earlier this year with a lone MLA backing her. OTTAWA Brian Topp burst out of the blocks in the NDP leadership race Monday, taking an early head start powered by some muscular endorsements. The Montreal-born party president became the first official candidate in the race to succeed the late Jack Layton, who died of cancer last month. He was accompanied by party icon Ed Broadbent, the most popular and successful federal NDP leader — until Layton. Without fail, the quickest way to get intoxicated during a federal election is to play the "Ed Broadbent" drinking game at an NDP rally. Broadbent is adored within the NDP and his endorsement is widely considered to have been the tipping point that pushed Jack over the top in 1993. With Broadbent behind him and deep roots in his party, Topp now looks to be in the same situation as Paul Martin in 2003. Thomas Mulcair, the most likely effective challenger, must have been very disappointed to see Broadbent today. He may not want to play the role of Copps in this race. There's a long list of frontrunners in leadership contests who found out 6 months is a long time the hard way. Topp will be building an organization from scratch. He lacks both experience and charisma. He's also spilled a lot of ink over the past decade as a pundit, so I imagine there are at least one or two controversial comments he'll need to climb down from. Broadbent's endorsement makes him the frontrunner. But being the frontrunner doesn't mean much. The rules have been set. The NDP will select their next leader March 24th in Toronto. The entry fee will be $15,000, with a $500,000 spending limit. It will be one-member-one-vote, and unions will no longer receive a set percentage of the vote. Not that I would want the job, but were I in charge of the rules, I would have chosen Montreal as the location, to build on NDP momentum in Quebec. I also would have weighted votes by riding, to encourage candidates to sell memberships outside traditional NDP strongholds. But on the whole, I think the executive did a fine job. The timeline strikes the right balance, and ending the special status for unions is a key step for the NDP as it tries to remake itself into a more mainstream party. Well, the March vote means Thomas Mulcair will grace the NDP race with his presence. Mulcair is no doubt the favourite, but given the bleak NDP membership totals in Quebec, he has his work cut out for him. It likely doesn't help that no one inside or outside the party seems to like him personally, either. Brian Topp has been named as a frontrunner since the day Layton died, so I'd expect him to run, and contend. Odds are Francoise Boivin, Anne McGrath or Megan Leslie will run to ensure a strong female candidate. 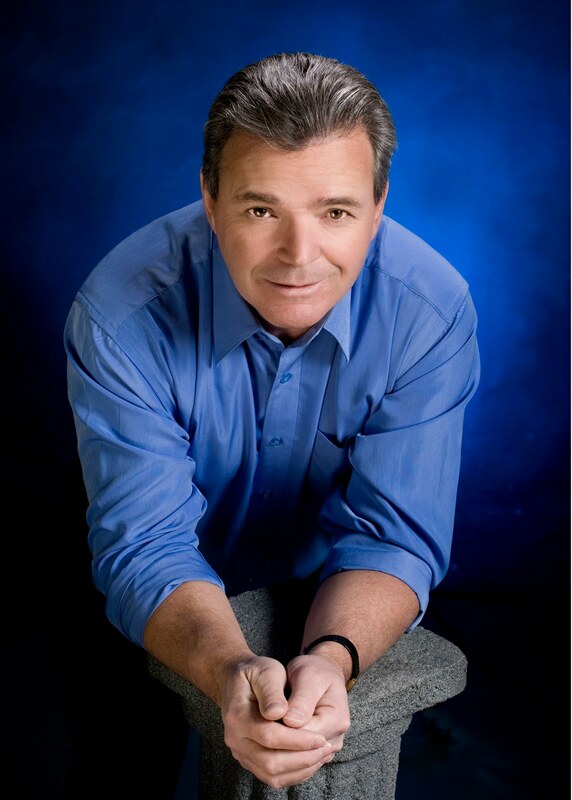 Pat Martin has said he's in, to provide comic relief. But if you put the Vegas odds in front of me, my money would be on Peter Julian or Paul Dewar right now. Lesser known MPs, but well-liked within the party and both possessing at least a pinch of experience and talent. It will be a busy fall politically, with provincial elections in Ontario, Saskatchewan, PEI, Newfoundland, and Manitoba. Although we likely won't see an Alberta vote until 2012, the province will get a new Premier, thanks to Ed Stelmach's surprise resignation in January. The first round of voting takes place on September 17th, and assuming no one gets the coveted 50% + 1, the three finalists will square off in a steer wrassling contest on October 1st to determine the winner. The announcement likely won't get a ton of media coverage - after all, if media reports are to be believed, former PC MLA Raj Sherman is heading for an easy first ballot victory. And let's be honest, Alberta Liberal leadership contests usually turn out to be about as important in the scheme of things as Bloc Quebecois nomination meetings in Mount Royal. 2. This is the first trial run of a primary-style "supporter system" in Canada, so politicos will be watching to see how many supporters actually take the time to vote. The Alberta Grits drew 4,500 votes when they picked a leader in 2008 - if they can triple that number, support for the system could pick up outside Alberta. 3. 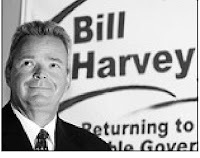 With Craig Chandler's ultra-Conservative PGIB backing Bill Harvey, the supporter system is getting a real test on just how "takeover proof" it is. If Harvey wins or comes close to the top, federal grits wouldn't dream of touching the system for at least a decade. 4. The ALP caucus is notorious for internal feuds, so it will be interesting to see whether or not the defeated candidates take their loss in stride. Hugh MacDonald has already raised doubts about the supporter list (without offering any proof) - if the defeated can't rally behind the winner, they might all find themselves out of work a year from now. 5. Finally, although a Liberal victory in Alberta seems far fetched, fanciful, ridiculous, or any synonym of your choosing, with the divided right the Alberta Liberals will be relevant in the next election. Their level of relevancy remains to be seen, but in an unpredictable election that might very well result in a minority government, it would be foolish not to pay attention to a party almost certain to pick up 20% to 30% of the vote. I can't say I have a horse in this race. All five candidates bring their own unique set of skills and liabilities to the table. But I'll certainly be watching the result with interest tomorrow. The writ drops tomorrow in Ontario for an October 6th vote, but for all intents and purposes, the campaign is already well under way. So for those tuning in after a summer away from politics, here's where the parties sit. Gone for the PCs is the lovable loser John Tory, replaced with Tim Hudak, the man with the golden smirk. Hudak was first elected in 1995...wait, is that right? How old was he then - 13? 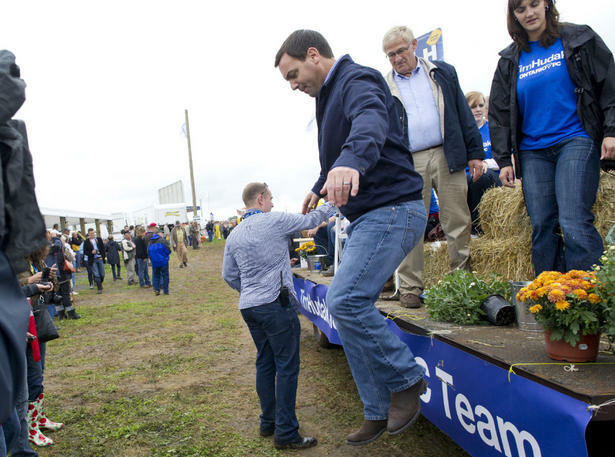 Despite his 16 years of elected experience, Hudak remains undefined for most and difficult to pin down. The best way to describe him would be to simply say he is the very image of a modern politician - he smiles a lot, can deliver a decent soundbyte, and promises lower taxes. He's not charismatic, but he's not uncharismatic either. If I were ever tasked with preparing a PowerPoint presentation on different human professions for visiting aliens, Hudak would likely be my case study of "politician". Even less well known than Hudak is the NDP's Andrea Horwath. While she won't be mistaken for Jack Layton on the campaign trail, Horwath seems likable enough (unless you're an environmentalist that is). Horwath fits into the NDP mould, talking about "positive campaigns" and "results for people"...all the while tossing out a few silly ideas like baning cars from moving within 1 metre of bikes on the roads. 2011 is a good time to look like you're cut from the NDP mould, so Horwath should do well, and could wind up a big player if Ontario wakes up with a minority government October 7th. Then there's Dalton McGuinty who, for better or worse, everybody knows. After a fairly low-key first term, McGuinty has spent the last four years doing the things voters say they want - investments in renewable energy, creating efficiencies in the tax system, helping businesses compete internationally, modernizing the economy...you know, big picture stuff. Of course, while voters may think 900 new wind turbines sounds good, most would probably rather get a tax rebate on their subway pass when all is said and done. So McGuinty enters the campaign a few points behind Tim Hudak. But either man could win. Or woman, for that matter. Yesterday, the Liberals released their platform , following up summer announcements from the PCs and NDP. The Liberal platform focuses heavily on their record, and features a host of third party validators - everyone from Bill Davis, to David Suzuki, to the Toronto Sun. As for new policies, the platform is rather modest - outside of some cash for education, there aren't a lot of big ticket items. Which makes sense when you're being called "the tax man" by your opponent. Above - Hudak on McGuinty's record, McGuinty on McGuinty's record, and Horwath talks about helping the little guy, while sitting in what appears to be a million-dollar house. OTTAWA — Thomas Mulcair says he won't run for the leadership of the NDP unless the party agrees to hold its convention in late winter or early spring, because he wouldn't be able to compete in a short race. "If what some people seemed to be angling for, which was January, if that ever came to pass, you know, I'd just continue working very hard to do the best we could, but I would never be part of something where there wouldn't be a level playing field," he said Friday. 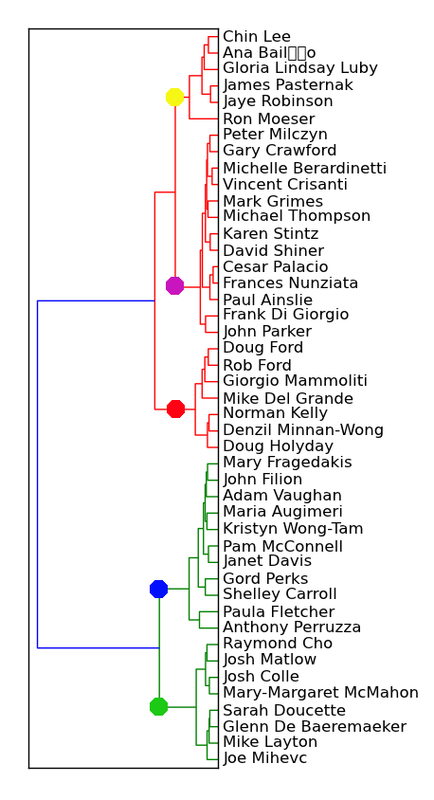 For those who weren't forced to spend your early 20s labouring through fourth year statistics courses and cursing SPSS on a nightly basis, the closer two names are "linked" together, the more often they voted together. For example, the Ford brothers are linked directly to each other since they tend to vote together. 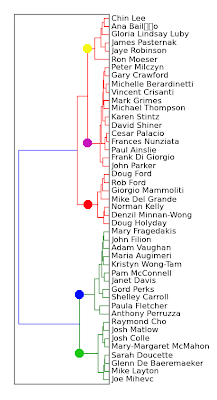 Their next closest links are to Giorgio Mammoliti and Mike Del Grande. If you keep moving down the line, council can be cleaved into two groups - the "green" and "red" lines above. Those familiar with municipal politics in Toronto will quickly recognize which side of the political spectrum each group falls. 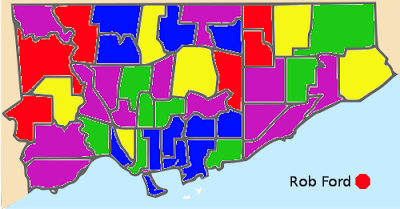 To come up with a visual, the five largest clusters were coloured into the ward map - blue and green clusters represent councillors voting with the "lefties", with the yellow, red, and purple clusters representing those voting with the more conservative elements of council. As you might expect, the blue in green clusters are concentrated downtown, with the red, yellow, and purple clusters generally further out in the suburbs. There are, of course, exceptions. York councillors Anthony Perruzza and Maria Augimeri find themselves close to the Adam Vaughans and Paula Fletchers of City Council. Meanwhile, Davenport's Ana Bailao checks in with a more conservative voting record than you might expect given her riding went NDP this May.